Welcome to Day 58 of our Divi 100 Marathon. Keep tuning in for 100 days in a row of awesome Divi resources as we count down to the amazing release of Divi 3.0 on the final day of the series! In today’s Divi 100 post we’re giving away a compliment to Monday’s homepage layout pack. 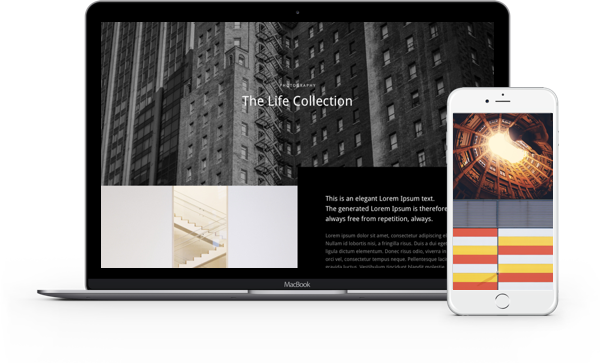 This layout pack is something you can use to display a single collection of images (say as a custom project page) or even as a simple single-page website showcasing just one project. To use the Free Divi Creative Single Page Portfolio Layout Pack on your own Divi website you will first need to download it using the button below. Next, locate the file divi-100-single-page-folio-layout-pack.zip in your downloads folder and unzip it. Then, navigate in your WordPress admin to Divi > Divi Library and click the “Import & Export” button at the top of the page. Once the import has finished you will now have the ability to load your new Divi Creative Single Page Portfolio Layout Pack on any builder powered page by going to Load From Library > Add From Library. Each of the layouts below are designed to showcase a single project within a larger collection of projects. However, each could also easily be modified to function as a simple, one-page website for showcasing a single project. Tomorrow Nick announces the winners of our big showcase competition. With over $17,000 worth of prizes on the line you won’t want to miss the results! Extra, comme toujours ! Cependant, je ne parviens pas à importer le fichier json dans la bibliothèque Divi. L’import reste figé à 1% et 1min restante… Et n’aboutit jamais. Extra, as always! However, I can not import the json file in the Divi library. The import is frozen at 1% and remaining 1min … and never ends . I ran into the same problem, when importing via Divi > Divi Library > Import/Export. I have the same problem. Stuck at 1% ????? Nice!!! I can’t get enough of these packs! I look forward to reading the blog everyday now. As a photographer, what I’m looking for is a template where each project opens as a straightforward slideshow, with fixed heigth (responsive) whether the picture is portrait, landscape or square. I can’t figure out how to do that in Divi, which is strange as I consider that the default layout to present a photography project. Maybe I can do it and I didn’t figure it out, or maybe it’s just missing from the available layouts. I also found that mixing and matching Divi with JetPack photo galeries can give nice results. J’adore the layout #1 ! Hi, for the 3rd portfolio, how do you manage to have the text partly over the first fullwidth image ? I love the 100 days of Divi! Thank you so much for those awesome layouts! Not able to download – neither to the library nor in the page.